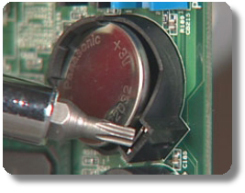 If your PC displays errors about the clock or CMOS when starting the PC, the CMOS battery on the motherboard probably needs to be replaced. 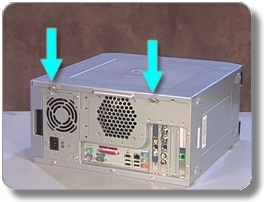 Desktop PCs use a battery to keep time when the they are off, much like a watch. Like a watch, the battery needs to be replaced when it runs low on power. Replace the battery using the steps below. Print this document for reference while working on the PC. Unplug all cables except for the power. Write down each cable location if you do not already know where it connects. Unplug the power cable and with the power cable removed press the Power button on the front of the PC. Your PC may look different than the images used in this document. The steps and images used in this document can be applied to most PC case designs. If opening the case or accessing the battery is difficult, refer to the Upgrading and Servicing Guide for your PC. If available, Upgrading and Servicing Guides can be downloaded from the manuals section of your PC support page. Slide the side panel off from the rear of the PC. Locate the battery. It is a small shiny round metal wafer (like a larger version of a watch battery). Remember which direction the battery is installed. Usually the engraved side, the positive side, is face up. 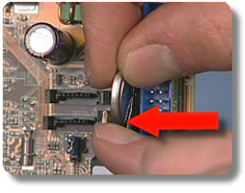 Remove the battery from the main board. Call a local computer supply store to see if a replacement is available. Use the inscriptions on the battery to answer any questions that the computer supply store may ask. Acquire the battery and replace it in the same socket it was removed from. Make sure the new battery is installed in exactly the same orientation as the previous battery. There is danger of explosion if the battery is not correctly replaced! Replace only with the same (or equivalent) type of battery. Replace a side panel by matching the side panel tabs with the tab openings in the case. Insert the side panel and slide it forward. Fasten the screws to secure the side panel. Connect all cables and turn on the PC to set the time.